For other uses, see Salento (disambiguation). Salento (Salentu in the Salentino dialect) is a geographic region at the southern end of the administrative region of Apulia in Southern Italy. It is a sub-peninsula of the Italian Peninsula, sometimes described as the "heel" of the Italian "boot". It encompasses the entire administrative area of the province of Lecce, a large part of the province of Brindisi and part of that of Taranto. 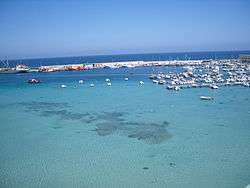 The peninsula is also known as Terra d'Otranto, and in the past Sallentina. In ancient times it was called variously Calabria or Messapia. 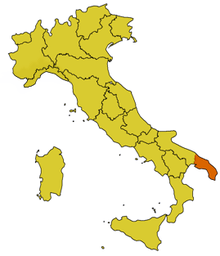 Messapia (from Greek Μεσσαπία) was the ancient name of a region of Italy largely corresponding to modern Salento. It was inhabited chiefly by the Messapii in classical times. Pokorny derives the toponym from the reconstructed PIE *medhyo-, "middle" and PIE *ap-, "water" (Mess-apia, "amid waters"). Pokorny compares the toponym Messapia to another ancient Italic toponym, Salapia, "salt water", a city in Apulia. Salento peninsula is composed of limestone, dividing the Adriatic Sea from the Ionian Sea. Known also as "peninsula salentina", from a geo-morphologic point of view it encompasses the land borders between Ionian and the Adriatic Seas, to the “Messapic threshold”, a depression that runs along the Taranto-Ostuni line and separates it from the Murge. Santa Maria di Leuca, in the Province of Lecce. 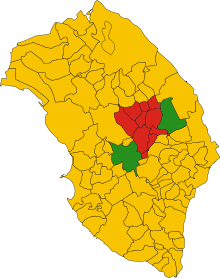 Brindisi, Carovigno, Cellino San Marco, Erchie, Francavilla Fontana, Latiano, Mesagne, Oria, San Donaci, San Michele Salentino, San Pancrazio Salentino, San Pietro Vernotico, San Vito dei Normanni, Torchiarolo, Torre Santa Susanna. Avetrana, Carosino, Faggiano, Fragagnano, Grottaglie, Leporano, Lizzano, Manduria, Maruggio, Monteiasi, Monteparano, Pulsano, Roccaforzata, San Giorgio Ionico, San Marzano di San Giuseppe, Sava, Torricella. Salento, from a cultural and linguistic point of view, does not include the city of Taranto, where the Tarantino dialect is spoken, nor the part of the province of Taranto to the west of the city (where Pugliese is the dialect generally spoken), nor the rest of the province of Brindisi to north of Ostuni (where the accent is influenced by the dialect of Bari). 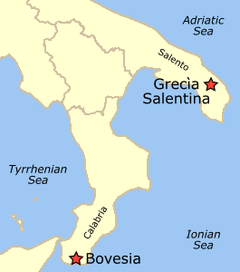 To the south and east of the above areas, an Italian dialect known as Salentino is spoken, as well as a Hellenic dialect known as Griko – a legacy of the settlement of Greeks in southern Italy during ancient times. The nearest international airports are those of Brindisi and Bari (the latter is out of Salento but not far). Leisure ports are those of: Taranto, Brindisi, Campomarino di Maruggio's tourist and leisure Marina, Gallipoli, Santa Maria di Leuca, Otranto. 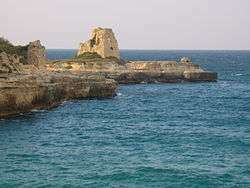 The coastal towers in Salento are coastal watchtowers, as the peninsula's coast was long subject to maritime attacks. The first towers may have been Norman. The remaining historic towers are mostly from the 15th and 16th centuries. Many are now in ruins. View of Torre Sant'Andrea, part of Melendugno's "marina". Alimini Grande Lake, near Otranto. Wikimedia Commons has media related to Salento. Wikivoyage has a travel guide for Salento (Italy). ↑ "The Towers Of Salento in Apulia - South Italy". Nel Salento. Retrieved 2009-08-17. ↑ "The vacances dans les Pouilles - Italy". Retrieved 2005-01-10.